We have joined with our friends at Babolat for one lucky winner to win a pair of Jet Mach II Shoes. 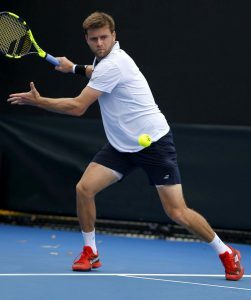 Babolat, recently announced Ryan Harrison (USA) has chosen to play with Babolat footwear and apparel. Harrison has played with Babolat rackets and strings since he was 12 years old. Currently ranked #44 on the ATP World Tour, Harrison is coming off a 2017 season that saw him reach a career-high singles ranking of #40, while winning the French Open Doubles title and the Memphis Open ATP Singles title. The 25-year-old American is known for his aggressive game, all-court athleticism, and competitive drive. The announcement assures Harrison will be exclusively equipped with high performance and innovative Babolat tennis equipment for the coming season. “Ryan is more than a world-class athlete, his dedication and passion for tennis make him a great partner for Babolat. 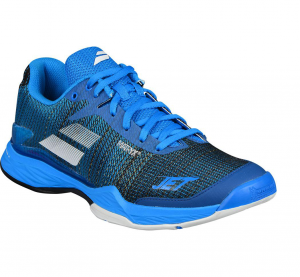 When we met this offseason to discuss what Ryan needed to keep progressing in 2018, it became apparent the new JET MACH II shoe was worth a test,” said Seth McKinley, Babolat International Sports Marketing Manager. The benefits of the switch are already being realized. Harrison reached the final of the ATP Brisbane Intentional, his first event in Babolat footwear and apparel. Harrison plays with the Babolat Pure Aero VS Tour racket, strung with Pro Hurricane Tour & VS Hybrid strings. Harrison joins Benoit Paire (FRA), Evgeny Donskoy (RUS), Yuichi Sugita (JPN), and Federico Delbonis (ARG) as players on the ATP World Tour equipped with Babolat footwear. A Michelin rubber outsole continues to offer reliable resistance to the wear and tear of frequent play, keeping you on the court playing for as long as possible. With its technical look and natural feel, Babolat has produced a shoe that’s sure to perform as good as it looks. Upper: One-piece upper constructed from Kevlar and Polyamide fibre produces enhanced lateral stability. Includes 4 straps of stiff mono threads for a homogeneous fit. Which US player has recently chosen to play with Babalot footwear and apparel. One winner will be selected from random from all corrected entries received. Competition closes at 23:59 on Thursday 15th March 2018. For full terms and conditions are available here. *Babolat promotion is advertised in participating stores. Offer without purchase obligation, non-cumulative (maximum of one voucher to be applied to any one pair of Jet Mach II), valid January 15 to March 15, 2018 or until stock lasts. Only new 2018 Pure Drive, not applicable to Junior products. £50 net immediate discount in-store (off the SRP – M: £130, W: £120), only on Babolat Jet Mach II, not applicable to Junior products and only accessible following the purchase of a new 2018 Pure Drive.